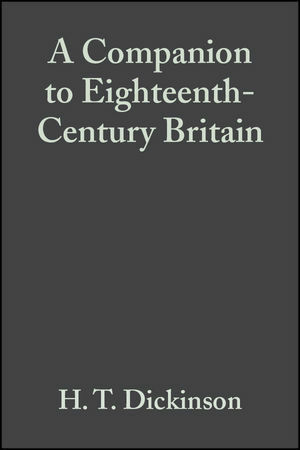 This authoritative Companion introduces readers to the developments that lead to Britain becoming a great world power, the leading European imperial state, and, at the same time, the most economically and socially advanced, politically liberal and religiously tolerant nation in Europe. Covers political, social, cultural, economic and religious history. Written by an international team of experts. Examines Britain's position from the perspective of other European nations. H. T. Dickinson is Richard Lodge Professor of British History at Edinburgh University. He is a former President of the Historical Association and a former Vice President of the Royal Historical Society. He has been a Visiting Professor at the University of Richmond. His numerous books include British Radicalism and the French Revolution 1789–1815 (1985), Caricatures and the Constitution 1760–1832 (1986) and The Politics of the People in Eighteenth-Century Britain (1995). He was also editor of the journal History from 1993 to 2000. "This superb work by leading historian of the period provides a series of introductions to the most important themes for study. The authors bring the most up to date scholarship to bear in their work. Readable, sensible, perceptive and intelligent. If there is one book to use for this century, this is it." "The accounts are succinct, very up-to-date and based upon regional as well as national evidence." "If this volume is any indication, the series will be successful. Dickinson has collected an array of prominent historians to digest and briefly discuss the trends in their respective fields. This is a collection of essays that most students will find exceptionally useful, and most faculty members will appreciate: Highly recommended." Shows how Britain became the leading European imperial state, and, at the same time, the most economically and socially advanced, politically liberal and religiously tolerant nation in Europe. Covers political, social, cultural, economic and religious history. Written by an international team of experts.